On November 19, seven low-income and uninsured Santa Barbara residents suffering from cataracts received the gift of clear, focused vision from local doctors and SEE International at a free eye-surgery clinic at Santa Barbara Surgery Center. Surgical Eye Expedition (SEE) International is a 35-year-old, Santa Barbara-based, nonprofit, humanitarian organization that provides ophthalmologic education, examinations, and surgery to fight vision loss in disadvantaged patients around the world. SEE held a similar free eye-surgery clinic two years ago and hopes to make this an annual event. “SEE is probably better known internationally than locally, but there is a lot of work to do here in Santa Barbara as well,” said SEE board member Dr. Michael Paveloff. Doctors Stuart Winthrop and Steven Zelko, along with Paveloff, performed surgery on seven patients experiencing severe vision impairment from cataracts. Cataracts are a slowly developing cloudiness of the eye’s lens. They usually become a problem later in life and pose a serious threat to one’s ability to earn money, care for one’s family, and generally to contribute to society. “It can be like walking in a fog,” said Cole Bailey, Santa Barbara Vision Care program provider. The Santa Barbara Vision Care program, as part of SEE International, works with local residents who need vision assistance and fall between the gaps of Medicare, Medicaid, and private health insurance. 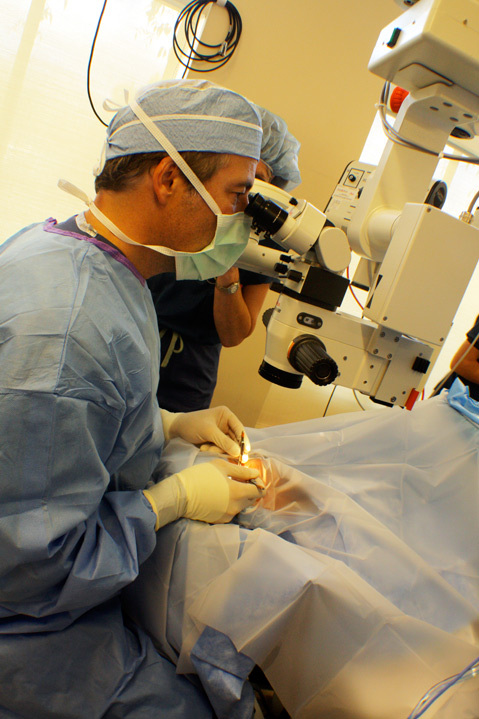 Patients at the 2011 clinic were awake as doctors used diamond blades to cut small, self-healing incisions in their corneas. Vibrating ultrasound tips broke up clouded cataract lenses, which were then vacuumed up through a small opening. New lenses with the patients’ personal prescriptions were finally inserted into their eyes. “All of the patients today were essentially blind, and they can drive tomorrow,” said Dr. Paveloff. This free clinic, and other SEE work, would be impossible without donations. Nurses, doctors, and support staff donated time and labor; Santa Barbara Surgery Center donated the facility and equipment; and Alcon provided individualized intraocular lenses and recovery medication. Globally, SEE International performs approximately 15,000 surgeries a year. SEE’s team of 11 Santa Barbara staff and its network of over 650 ophthalmologists in 75 countries do not operate in the United States outside of Santa Barbara. SEE International has provided surgeries for 23 Santa Barbarans in 2011 and routinely provides eye care for around 750 residents a year. County clinics and other agencies refer low-income and underinsured or uninsured patients to SEE. SEE then refers these patients to its local, affiliated ophthalmologists who add the patients to their caseload and perform surgeries for free. Many SEE ophthalmologists who go on global expeditions are trained in Manual Small Incision, which means the entire cataract surgery is done my hand, according to Bailey. They are able to perform surgeries anywhere, with or without advanced technology. SEE’s foreign expeditions last three to five days, but, in that short time, doctors perform 50-200 surgeries and examine up to 600 people, according to SEE International’s Grants Coordinator Rachel Johnston.